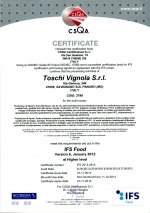 Toschi has obtained the certification of key food industry to provide its customers with products of excellent quality. Design, production and marketing of liquors, fruit with liquor, eau de vie, semi-manufactured and finished products for confectionery and ice-cream, candied fruit, candied fruit with syrup, syrups. Production of P.G.I. balsamic vinegar of Modena, P.D.O. traditional balsamic vinegar of Modena and wine vinegar. Production of liquors, fruit with liquors, eau de vie, semi-manufactured and finished products for confectionery and ice-cream, candied fruit, candied fruit with syrup, syrups. Production of P.G.I. balsamic vinegar of Modena, P.D.O. 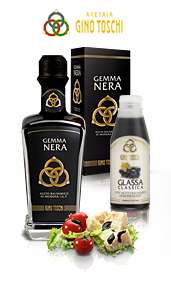 traditional balsamic vinegar of Modena and wine vinegar. Packing in bottle, jars and little amphoras (glass), in bottles and speed bottles (polyethylene), buckets (polyethylene and polypropylene), in cans (tinplate), in jerry cans and cask (PET, polyethylene), in bags (polylaminate aluminium). 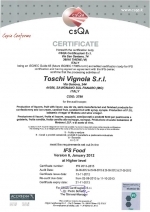 meet the requirements set out in the: IFS FOOD, Version 6, January 2012, at Higher level. Production of liquors, fruit with liquor, eau de vie, semi-manufactured and finished products for confectionery and ice-crem, candied fruit, candied fruit with syrup, syrups. Production of P.G.I. balsamic vinegar of Modena, P.O.D. traditional balsamic vinegar of Modena and wine vinegar. Packing in bottles, and little amphoras (glass), in bottle and speed bottles (polyethylene), buckets (polyethylene and plypropylene) in cans (tinplate), in jerry cans and casks (PET, polyethylene), in bags (polylaminate aluminium). Halal quality certification ensures that the product follows Islamic law in all stages of production, packaging and distribution. 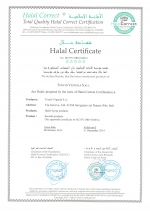 The consumer, Muslim or not, can therefore be certain that the product, guaranteed as Halal, respects the dictates of the Shari'a. 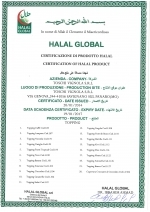 We declare Hereby, that the below mentioned products of Toschi Vignola S.r.l are Halal; prepared by the rules of Halal Correct Certification. 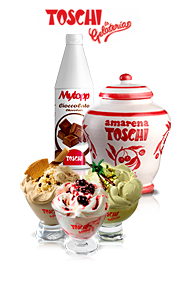 Product: Topping, Syrups, Products for ice cream preparation and for confectionery. 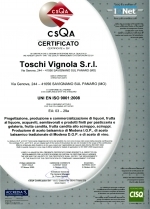 Toschi Vignola Srl subscribes to French legislation that requires, from 2015, an indication of the logo Triman for the companies that sell, on the French national territory, products with recyclable packaging destined for recycling. to declare the products listed in Annex I to this certificate, as being compliant with Regulation 834/07/EC together with subsequent amendments. 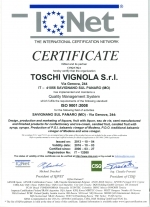 The validity of this certificate is bound to the constant compliance with the Regulation for the BioAgriCert certification, and to the outcomes of the monitoring process. 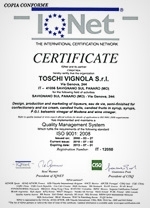 The certificate was issued under art. 29, par. 1 of Regulation 834/07/EC and art. 68 of Regulation 889/08/EC. The Operator to which the declaration refers submitted its activities to a check, and meets the requirements contained in the regulations mentioned above. 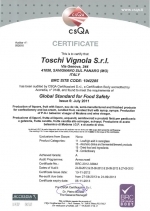 The distribution of the certificate is to be carried out by reporting clearly the word "COPY" and the recipient in "the list of distribution ". The Operator is to keep an updated list of recipients. a) The products with the code are authorized for sale to consumers. Their introduction into the market can only occur after the label has been approved by BioAgriCert. 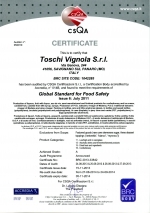 The code must be indicated on the label, and allows the assessment of the Certificate of conformity on the websites www.bioagricert.org and www.trasparente-check.com. b) Products having the note 1) and 2) are authorized for sale to controlled Operators, and must be accompanied by the original of the transaction document. 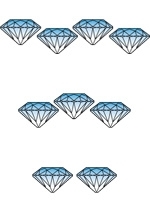 The transaction document is to be filled in using a computer, and the identification code for the transaction is made up of the alphanumerical code printed on the document. 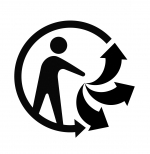 Notification of transaction data to BioAgriCert and the Certificate of Conformity may be assessed on the websites www.trasparente-check.com and www.bioagricert.org by entering the identification code for the transaction indicated on the document. c) The products having code and note 1) and 2) are authorized both for sale to consumers and for sale to controlled Operators. The Operator is responsible for the introduction of the products into the market, and for the declarations of conformity in the labels and in the transaction documents. 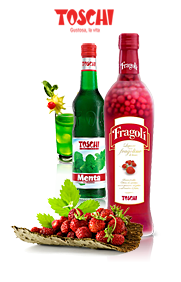 Design, production and marketing of liqueurs, eau de vie, semi-finished for confectionery and ice cream, candied fruits, candied fruits in syrup, syrups, P.G.I. balsamic vinegar of Modena and wine vinegar. Produzione di liquori, frutta al liquore, acquaviti, semilavorati per pasticceria e gelateria, frutta candita, frutta candita allo sciroppo, sciroppi. Produzione di aceto balsamico di Modena I.G.P. 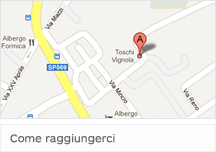 e di aceto di vino. Harmonious balance of natural sugars and intense flavors. Ideal as an addition to risottos or grilled meat or game. A unique blend of flavor contrasts - sweet and sharp, spicy and mellow with rich dark color and natural sweetness. Perfect poured lightly over a fine steak or mushrooms and grilled vegetables or as an ingredient in that special Dijon vinegarette. The perfect blend of quality and affordability. Fruity in flavor, dark and aromatic. Excellent added to your favorite gravy, for salad or in a brown butter sauce over meat and fish. Production of liquors, fruit with liquor, eau de vie, semi-manufactered and finished products for confectionery and ice-cream, candied fruit, candied fruit in syrup, syrup. Production of P.G.I. balsamic vinegar of Modena and wine vinegar.